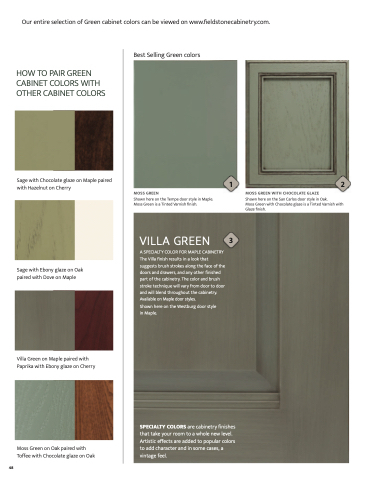 Our entire selection of Gray cabinet colors can be viewed on www. eldstonecabinetry.com. Shown here on the Rally door style in Maple. Peppercorn with Ebony glaze is a Tinted Varnish with Glaze  nish. Shown here on the Aero door style in Oak. Peppercorn is a Tinted Varnish  nish. Shown here on the Sedona door style in Maple. Peppercorn with Chocolate glaze is a Tinted Varnish with Glaze  nish. Shown here on the Riverdale door style in Maple. Peppercorn with Nickel glaze is a Tinted Varnish with Glaze  nish. Shown here on the Aero door style in Oak. Peppercorn with Chocolate glaze is a Tinted Varnish with Glaze  nish. Shown here on the Grif th door style in Oak. Shale with Ebony glaze is a Tinted Varnish with Glaze  nish.